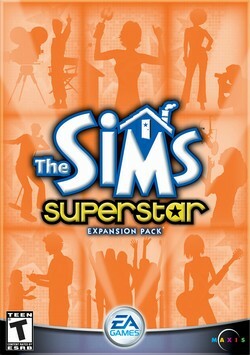 The Sims: Superstar is the sixth expansion pack of seven of expansion packs released for the strategy/simulation computer game The Sims. This expansion allows the player's sims to become entertainment figures and includes representations of several famous Hollywood personalities. Sims can now become superstars, such as supermodels, actors or singers. These jobs are unique to the Sim games in that the player controls the sim at "work". Sims must raise their Charisma, Body and Creativity levels high enough to gain the attention of the paparazzi. Superstar includes representations of a number of real-life celebrities that include: Avril Lavigne, Andy Warhol, Christina Aguilera, Sarah McLachlan, Jon Bon Jovi and Marilyn Monroe. They will periodically appear in the Studio Town lots. Upon reaching a certain level of stardom, Sims may have an "obsessed fan," who stalks them, and eventually leaves black roses on their property. A new environment, Studio Town. Superstar offers a range of new objects, including mud baths, massage rooms, indoor deep sea diving simulators, sushi bar, and trophy cases. A new High Fashion clothing category. Four new channels are available with the purchase of a satellite dish: Sports, News, Entertainment and Animals. Going to Studio Town, like going Downtown in The Sims: Hot Date or to Old Town in The Sims: Unleashed, freezes the clock for the household. Although time appears to pass in Studio Town, your Sim will always return to his or her house at the same time he or she left. This essentially gives the Sim more hours in the day to use for skill-building, recreation and socializing. Becoming a Superstar requires near perfect levels in Charisma, Creativity, Body, and the other personal attributes, maintaining a network of famous friends, and luck in producing good records, films, and runway shows, though they will not matter anymore when a Sim becomes famous. Sims that have developed their personal attributes enough can easily move between the different categories of superstar, allowing the player to change career as they choose. If a Sim performs exceedingly well, he or she may be visited at their home by a "fading star" to receive an Oscar-like statue called a "Simmy" for all-around success. They may also receive awards in Studio Town for success in individual categories to bring home and put on display. The game gives a take on Old Hollywood throughout, including characters such as Andy Warhol and Marilyn Monroe in Studio Town, which itself is a take-off of Hollywood. Superstar includes many 1930s-era Art Deco inspired objects, architectural elements and fashion designs that all refer to various Hollywood and glamorous stereotypes.